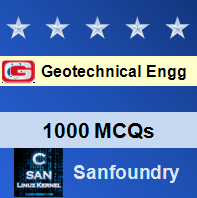 This set of Geotechnical Engineering Multiple Choice Questions & Answers (MCQs) focuses on “Active Earth pressure: Rankine’s theory”. Explanation: As originally proposed, Rankine’ s theory of lateral pressure is applied to uniform cohesion less soils only. Later, it was extended to include cohesive soil. Explanation: The theory of lateral pressure was extended to cohesive, stratified, partially immersed and submerged soil was by Resal in 1910 and by Bell in 1915. Explanation: According to the assumption of Rankine’s theory, the soil mass is semi-infinite, homogeneous, dry and cohesion less. 4. Which of the following cases for cohesion less backfill in Rankine’s theory is considered? iii) Backfill with a sloping surface and inclined back and surcharge. Explanation: The retaining walls are constructed of masonry or concrete, due to this the frictional force develops. The existence of the friction makes the resultant pressure inclined to the wall at an angle that approaches the frictional angle between the soil and the wall. ii) Lateral pressure due to water. Explanation: The earth pressure at rest, exerted on the back of the rigid, unyielding retaining structure, can be calculated using theory of elasticity. iv) Hard clay – 0.5. K0 = 1 – sin φ. 10. What will be the coefficient of earth pressure at rest for a rigid retaining wall, If the backfill consists of cohesion less soil having φ = 26°?